What started as a Rant about how much I love my Granite Countertop appears to be almost a Hatfield and McCoy argument. I personally find it so strange; I even wonder if the stories that put granite in a bad light are propagated by the quartz manufacturers. Trust me I don’t have anything against Quartz, some of it is quite beautiful, but many colors seem to be wannabe Granite colors! With a huge price tag! I had a stunning Venetian Gold counter top put in my kitchen 10 years ago. I have gazed in wonder at its beauty for all that time. My guests always comment on how incredibly gorgeous it is. The natural beauty created millions of years ago cannot be denied. You want movement, it has swirls, it has speckles, and it moves everywhere. The colors are magnificent, no possible way it could be duplicated with a quartz product. But if it was beautiful and difficult to maintain I would not be so impressed, but in 10 years I have done nothing except wipe it clean. No sealers, just plain old living with 3 kids. Baking, cooking, arts and crafts, parties with lots of grape juice and wine spills. Nothing has ever been an issue. I love my Granite top, for its incomparable natural beauty and the resilience. I would hate to see someone who loves the look of a particular granite for their countertop deny it to themselves because others talk about the amount of maintenance required, as it truly is not the case. I believe if you ask your supplier which granite requires little maintenance, and many many of them do you will get some good, very appropriate suggestions. 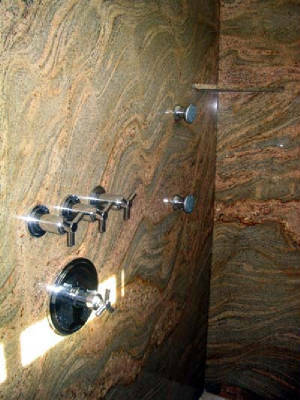 Do not be mis-lead by marketing tools into paying more money than you need to for a stunning looking counter top. I will continue to gaze at my kitchen countertop and feel so grateful that it graces my home; my guests will continue to comment long after those teenagers have left the nest. So for me, granite is the way to go, quartz may try to come close, but in my mind it is just no cigar! Just because I think this is such an interesting topic, I am going to ask my friends and report back: Feel free to comment. What’s “in”, in Counter top thicknesses? 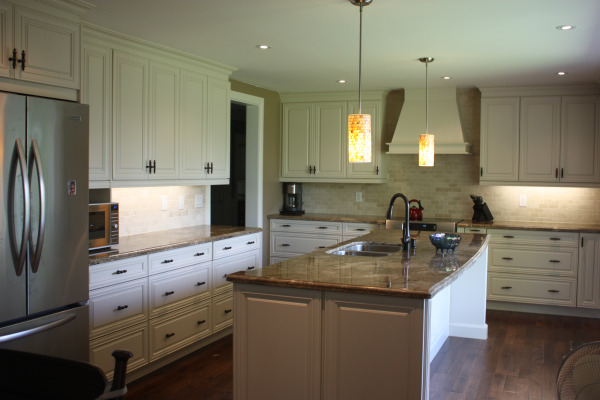 For many years, ¾” Granite and quartz was the go to thickness for counter tops. Many times, especially in kitchens, the edge is laminated to a 1 ½” edge. This size edge is perfect for framed cabinets since that thickness edge can cover the gap between the top of the cabinet and the cabinet door. Even as cabinets became frameless, 1 ½” edging is still popular. But what about people on the cutting edge? What thickness counter tops are they interested in? For the last few years, thick counter tops with 2 – 3” mitred edges was the story. On islands, the thick edge and material would also go down the side of the cabinets to the floor to create a thick side panel. This gave the counter top a thick and substantial look. This is still very popular in North America. In Europe the emerging trend is to go with super skinny counter tops – 1 cm thickness material. This look is sleek and modern. 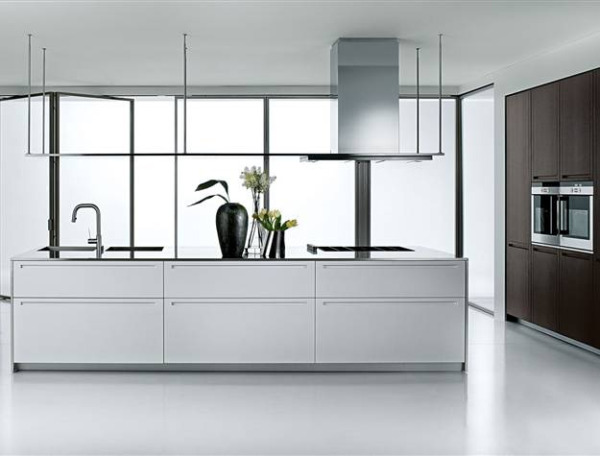 It goes along with the whole integrated kitchen/home idea that is so popular right now. Appliances are built to be hidden from plain view or its appearance as muted as possible. 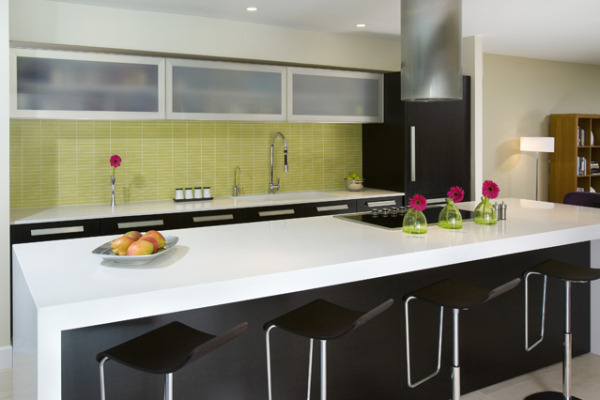 Likewise, counter tops are becoming more subtle in terms of material thickness. Latitude currently has various 1CM quartz material in stock and acrylics such as Corian and Staron come in 1CM only (traditionally, Corian and Staron edges are built up to that thicker looking edge). It is a new look that will definitely make its way to North America.